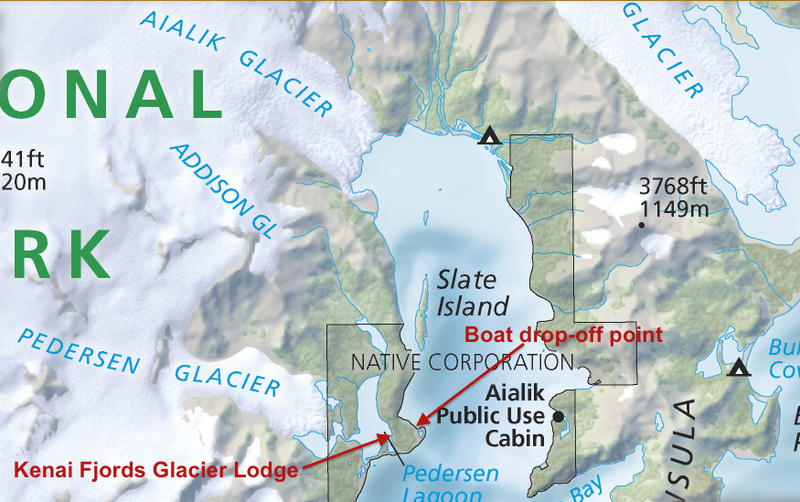 After a good night's sleep at the Whistle Stop, we walked to the Seward boat office for Kenai Fjords Glacier Lodge about a half-block away. 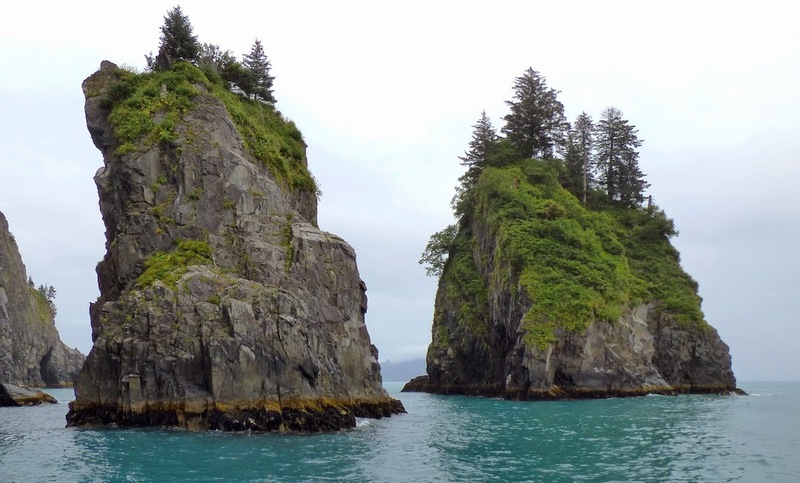 The boat, a small catamaran named the Wild Lander, was due to depart at 10:00 am; we arrived at 9:15, with me fully medicated against sea-sickness (hopefully) and ready for this four-hour trip, which touted spectacular views along the Kenai Peninsula of mountains, glaciers, and wildlife. Though I very much wanted to see whales, I tried not to come with that expectation. I looked forward to seeing some interesting landscapes and more sea otters, which, between you and me, I was pretty excited about. Considering that this part of Alaska is a temperate rain forest, it was not surprising that, once again, it was raining. While we waited to board, I pulled my rain pants on, guessing that various surfaces on the boat would be wet from rain and sea spray. (It would be approximately 5 days before I took them off again.) Once on board, we were given boat safety tips from the skipper, Jessica, and advised of what our trip would entail. Navigating south through Resurrection Bay, west around the tip of Aialik Peninsula, and then north into Aialik Bay, we would have many opportunities to view the fjords and any animals that happened to be around. Lunch, consisting of sandwiches, soup, and other various snacks, would be served on the boat, but the crew warned that the seas were expected to get rough when heading around Aialik Cape, so it was advised that everyone wait until after that segment of the journey to dig in. Apparently the weather had been unfavorable for a while; the seas had been rough, and the previous trip to the lodge was fraught with sea-sickness. At the end of the trip, Jessica admitted that she had been worried that our voyage was going to be more of the same. She was afraid that everyone was going to be miserable and throwing up, and there would be no animal sightings. However, ours would turn out to be the best trip of the summer up to that point in her opinion (maybe not counting the weather, although it's possible that the gloominess contributed to the multitude of animals being out on the water). 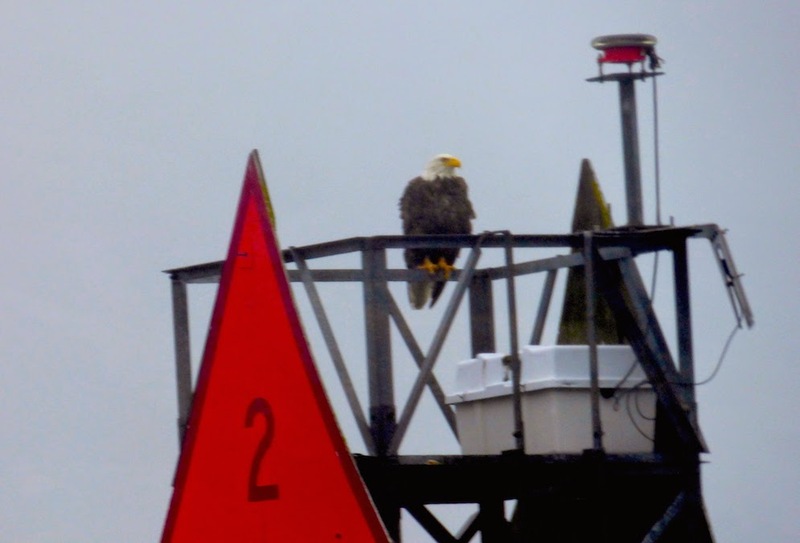 As the boat pulled away from the harbor, we immediately had our first wildlife encounter of the day in the form of a bald eagle perched on a docking beacon. 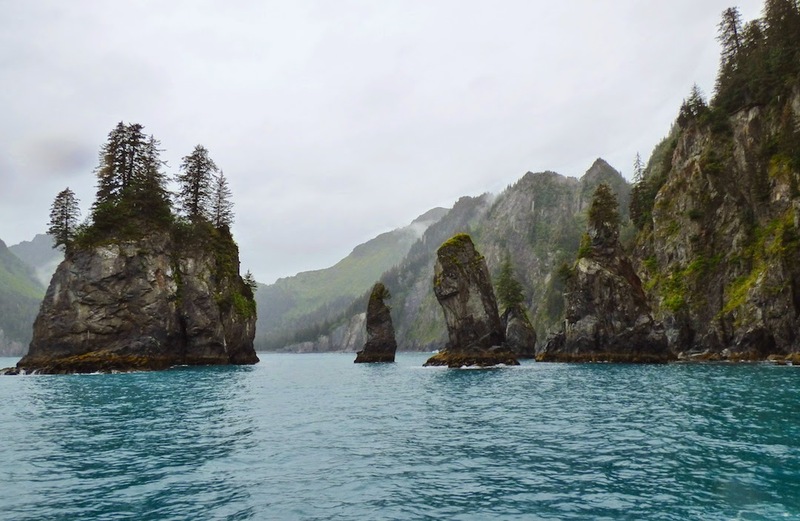 We headed out into the gloom of Resurrection Bay toward the open waters of the Gulf of Alaska and into an unforgettable experience. The scenery was gorgeous, with lush, green mountains giving the illusion of being in the tropics – until one noticed the ice and snow capping them. Jessica constantly scanned the water looking for wildlife, and it was interesting to witness her and various other boat skippers working together to keep each other informed of good wildlife viewing opportunities so everyone could participate. About halfway through the trip, I started to feel queasy and worried that the sea-sickness medication was not going to be adequate. This coincided with the rough waters off Aialik Cape, and after spending time in the fresh air off the back of the boat and being distracted by more scenery, the feeling passed and I was brave enough to eat a sandwich. Before the final leg of the journey into upper Aialik Bay, we took in some picturesque spots where the combination of mountains, trees, and low clouds created painting-like landscapes. Sadly, I don't know where, exactly, these areas were or if they had names, so I can't pinpoint them on a map. We also detoured into Holgate Arm for a close view of Holgate Glacier's terminus – a gorgeous, bright blue wall of ice at the edge of the water. 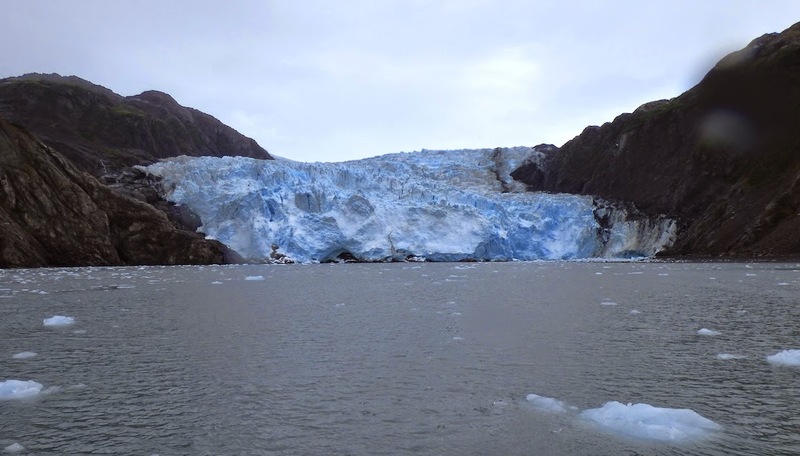 As we approached our drop-off point – a stretch of cobble beach tucked around a curved, protruding piece of land separating Pedersen Lagoon from Aialik bay – we enjoyed the view of Aialik Glacier at the north end of the bay. 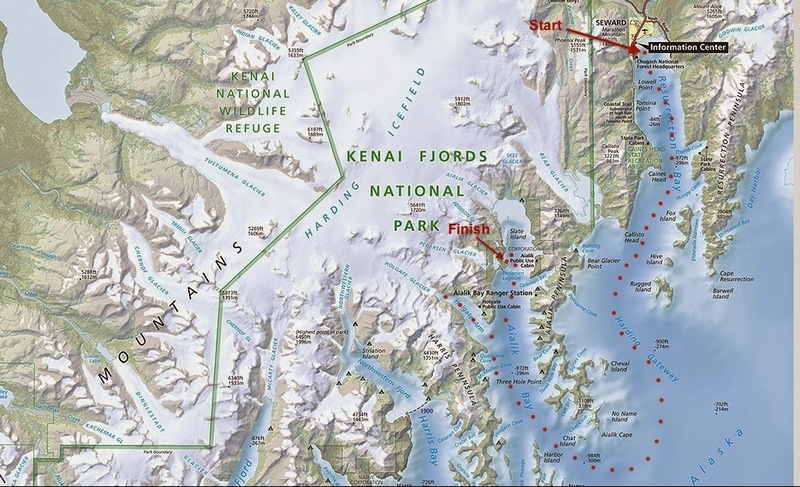 We would become more familiar with the upper bay and glacier in the following days during our stay at Kenai Fjords Glacier Lodge, which is hidden on Pederson Lagoon, a short walk away through the forest, and the subject of the next blog post.